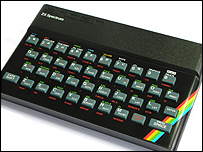 As for the gaming side of things, my adolescence was filled with time spent battering that rubber keyboard attempting to make Daley Thompson run a bit quicker to win the decathalon, cheering on tiny stick men that played out the highlights of matches in Football Manager as I made my way up the divisions, and fought and traded my way across the galaxy in Elite – still one of my favourite games ever! There were many, many more games, some of them not so good. But the good ones were typically really good. I think this was because the limits of the machine meant that there wasn’t flashy graphics and 5.1 surround sound, so gameplay was really important. None of the games could look so good that it didn’t matter so much if it was crap to play. And now, the legacy of the Spectrum lives on. Rare, the studio that has created games such as Goldeneye 007 for the N64, and Viva Pinata for the XBox 360 (and many more) began life creating some of the best Spectrum games. Founded in 1982 by the Stamper brothers, it went on to create chart toppers for the Spectrum throughout the 80s, and followed those up with games for various Nintendo platforms, before being acquired by Microsoft in 2002 for US$377 million. Earlier this year, the Stampers announced they were leaving Rare to pursue other interests. All this, from a small black box with rubber keys.